Why Is The Maduro Government Demonetizing the Bs. 100 Note? On Sunday, December 11, Venezuelan President Nicolás Maduro announced that the 100 Bolivar (B for short) note would no longer be legal tender, after a 72-hour grace period in which Venezuelans could deposit them in bank accounts or exchange them for other currency. After that they would have ten days (later reduced to 5 days) to deposit them at two locations of the Venezuelan Central Bank. At the time of the measure there were over 6 billion 100 B notes in circulation, representing almost 80% of Venezuela’s currency, this measure has unsurprisingly caused economic and social turmoil. Protests and lootings occurred across the country in the past week. In Ciudad Bolivar, looting continued through Sunday. In response, President Maduro took a step back and suggested that the Bs. 100 note would be valid currency through January 2. The disastrous consequences of this demonetization were predictable to most observers, and has generated condemnation from everyone from the Venezuelan Episcopal Conference, to the Organization of American States, to ally China. Why are they doing it? The government’s explanation is that there are mafias hoarding Bs. 100 bills as a form of economic war. While this certainly would explain the shortage of currency that Venezuelans have been experiencing in an economy that this month officially entered hyperinflation, it is absurd to think that anybody in their right mind would want to hoard a currency that has lost sixty percent of its value in the past two months. If they were purchasing Venezuelan currency to buy price-controlled Venezuelan goods, they would be spending it as quickly as possible, not sitting on it. What then does explain this seemingly inexplicable measure? The following are some of the most likely explanations circulating among observers: the government wants to recycle the paper, it seeks to improve its balance sheet, or important players want to facilitate money laundering. Many of these 100 B notes are brand new and the paper is in good condition. Some analysts have speculated that the government could be aiming to bleach and reuse the paper for the new higher denomination bills. But while it is likely that the paper itself is worth more than the face-value of the 100 B note, it is not clear that recycling the paper would actually be worthwhile compared to just printing or ordering new ones. However, it could still be cost-effective for counterfeiters to recycle the 100 B notes as their access to high quality currency paper is more difficult. Indeed there have been cases in the past of travelers detained taking suitcases full of Bs. from Venezuela most likely for counterfeit operations. What this measure does do, is help the government’s balance sheet. Every bill or coin emitted by a government is essentially a little “IOU” suggesting its central bank would honor it with something, for example gold, foreign currency or credit against taxes. 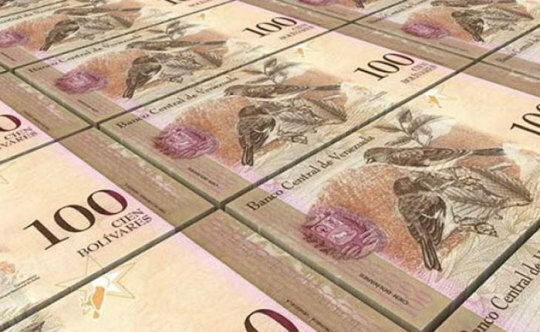 If one quarter or one third of 100 B notes are never turned in, it will effectively wipe away a chunk of the Venezuelan Central Bank’s liabilities. That will give it a better balance-sheet as it starts to print the higher-denomination notes. This apparently was one of the motivations behind the recent demonetization in India. However, the potential earnings for such an operation seem paltry for the economic disturbance and political costs it creates. Francisco Monaldi sent me the following calculations. There are 6 billion 100 B notes. In other words, they are annulling around 600 billion Bs. But at the parallel rate this is less than $200 million. Let’s suppose 30% don’t get turned back in. That’s $60 million, which is not a lot of money for an oil state and could hardly justify this measure. Another hypothesis being discussed is that stakeholders have created this as a mechanism to launder illicit cash. The flood of deposits and the easing of requirements to open bank accounts indeed provide the perfect circumstance to introduce large sums of money into the banking system without detection. Undoubtedly the measure has been taken advantage of for such purposes. But it is hard to imagine that this is its actual purpose. If people with illicit earnings exercise power so high up, they would presumably have enough power to launder their money in an easier, more discrete way. The most probable logic, in my view, combines the probabilities that the government: actually believes there is money being hoarded, understands the logic of improving its balance sheet, overestimates its administrative capacity, and has a high tolerance for turmoil. This is a government that believes in economic controls. It tries to control: the production of goods, the distribution of goods, the price of basic goods, and even the price of the currency. Maduro and his closest advisors simply don’t believe in markets, in other words, exchange relationships in which production, distribution and prices are determined by supply and demand. From the Marxist presuppositions Maduro and his advisors work with, markets are an ideological construct used to obfuscate what are really intentional and interested economic strategies aimed to control and monopolize resources, and which need to be responded to in kind. Believing in the capacity to control the economy, it is only logical that when things go wrong, they do not immediately think their policies have created disequilibria. Rather they think their counter-revolutionary enemies are conspiring to sabotage otherwise viable programs. These ideas might sound impossibly discredited, but suffice it to say that there are many professional academics who are on board with this logic. So if people who live the life of the mind believe it why wouldn’t Maduro and his circle of advisors? Indeed, one can start with the supposition that if maduristas believed in markets, they wouldn’t be maduristas. The Maduro Administration would love to burn the money changers in Cucuta who they blame for driving up the parallel dollar—and there is some indication they have. They know there is a lot of cash from illicit transactions–including drug trafficking, organized crime and contraband–stockpiled in Bs. waiting to be laundered—there is some evidence of this too. They also know that some currency has been taken abroad by counterfeiters. And someone in the BCV has probably explained to them how this can improve their balance sheet. So they decided to make a bold move. One necessary element of believing in controls is the overestimation of your administrative capacity. The Maduro Administration likely thought that they could pull this off without too much of a problem, and that those hurt would be big operators with truckloads of cash. But of course, the people who are most affected are the poor who work in the informal economy, and those in rural areas of the interior. It should be no surprise that the most significant protests have happened in far-flung places in Apure, Trujillo and Bolívar. More affluent sectors operate mainly through electronic transactions and have been less affected, hence the relative calm in Caracas. In any case, from the perspective of people identifying as revolutionaries, a little turmoil is as much an opportunity as a danger. Revolution, after all, is seen not as a one time taking of power, but a continual overturning and renewing of the structures of society. Mao Zedong’s “cultural revolution” in the 1960s and 70s continually provoked chaos that undermined the economy, and educational and state institutions. But while Chinese society deteriorated, every crisis concentrated power in Mao’s hands a little bit more. In this case, demonetization of the 100 B note has allowed the government to create some drama to distract people from the humiliating operation that will see the currency’s largest note exchanged for a coin. It has also allowed Maduro to keep everybody off balance—most particularly the opposition which has been reduced to responding to these measures instead of talking about elections and political prisoners.